Breaking from post 3 under Mike Smith as the 8/5 favorite, Omaha Beach raced three-wide in the clubhouse turn to avoid getting much feedback while One Flew South held the early lead, but by the time the field straightened out on the backstretch, Omaha Beach was fighting along his outside. Beginning to hold an advantage as he neared the far turn, Omaha Beach began slowly pulling ahead and emerged onto the front stretch with slim advantage. The 9/5 second choice Improbable was running just off of his right hip, though, and the two soon engaged in a thrilling stretch battle. Despite his opponent’s best efforts to range up alongside, the Richard Mandella trainee refused to let Improbable get close and dug in to hold on for the victory by 1 length. Omaha Beach’s final time for the 1 1/8-mile event came in a final time of 1:49.91. Improbable, wearing blinkers for the first time, came up just short for the second straight time, having been caught in the late stages of the first of two Rebel Stakes (G2) divisions last month. With new rider Jose Ortiz aboard, the Bob Baffert trainee was initially fractious in the gate but emerged unscathed. Afterward, Baffert said he was pleased with his steed’s efforts. Country House rallied to take third late but was left with too much to do as far as catching the front-runners. Laughing Fox was 1 length behind in fourth, while Galilean took fifth. Long Range Toddy did not seem to take to the off track and finished a disappointing sixth over Jersey Agenda, while Tikhvin Flew necked out Gray Attempt for eighth. Six Shooter and a spent One Flew South completed the order of finish. 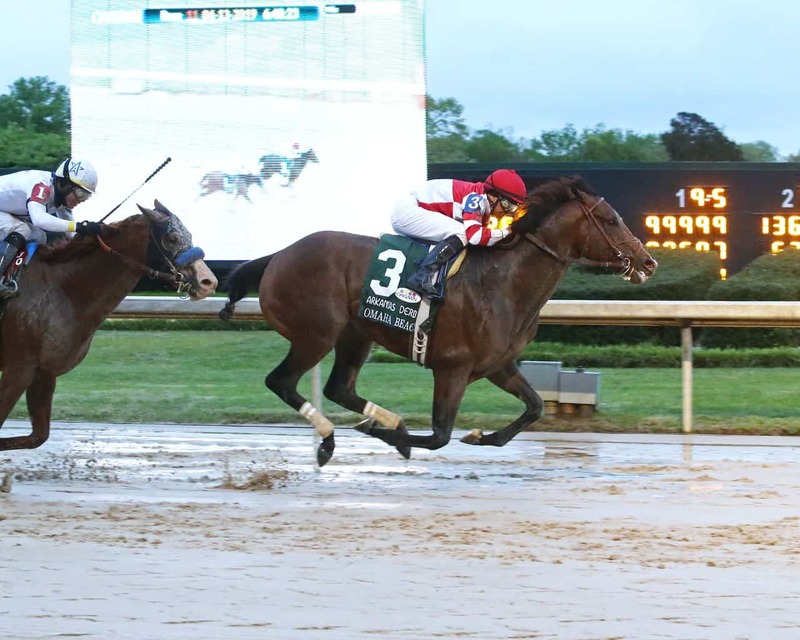 The Arkansas Derby is the final stop on the Road to the 2019 Kentucky Derby prep race season. Omaha Beach earned 100 points for the win, with Improbable receiving 40 for second, Country House 20 for third, and Laughing Fox 10 for fourth. The top three finishers are all safely in the Kentucky Derby gate based on points, as is Long Range Toddy. Omaha Beach’s win was his third straight, following a maiden-breaking effort in the Santa Anita Park slop and a tough victory over Game Winner in one of the two Rebel Stakes (G2) divisions. The 3-year-old son of War Front increased his record to 7-3-3-1 with $1,121,800 earned. Omaha Beach returned $5.40 to win, $3 to place, and $2.80 to show. Improbable brought back $3.60 to place and $3 to show, while Country House paid $4.20 to show.